Too close to my work. Beard Papas has some company now. Chewy Junior, hailing from the city state of Singapore, has arrived in Vancouver. Located at the western edge of Gastown across from Steamworks, Chewy Junior finally opened its doors in late August. I was curious about these Singaporean cream puffs as I walked past the renovating space for months looking at the posters featuring their confections. They seemed more complex than Beard Papas but not as polished as Beta5’s elevated, highfaluting versions. So on a particularly rough work week, I needed some treats to get me through and it resulted in me eating 4 varieties of Chewy Junior’s offerings. This shop currently serves 2 kinds of cream puffs: chocolate dipped and not chocolate dipped. On my first visit I went with one of each: Oreo and Blueberry Cream Cheese. Overall both types are not very big, measuring 3 inches in diameter and between 1.5 inches – 2 inches in height. The Oreo cream puff is a chocolate dipped type. The Oreo crumb coating is adhered to the top of the pastry by a thin layer of chocolate, hence why they are referred to as chocolate dipped. 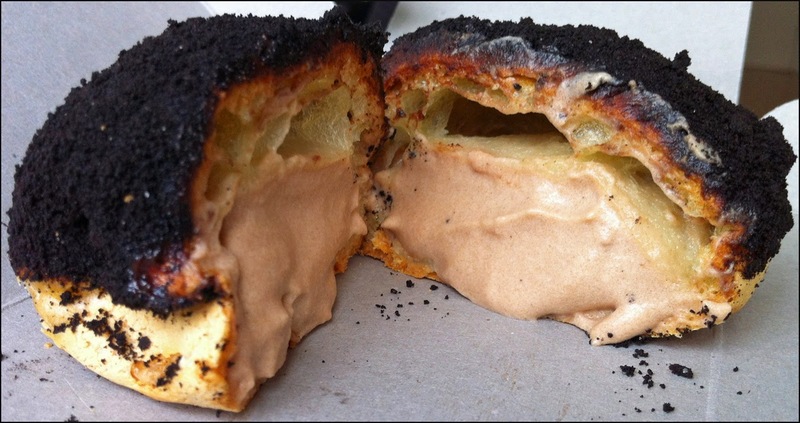 Inside the slightly chewy choux pastry, a cocoa infused whipped cream can be found. I was worried all this chocolate would be too sweet for me. However I actually quite enjoyed the Oreo. I found the elements of the unsweetened filling, slightly bitter Oreo crumbs and under coat of sweet chocolate complemented each other very well, resulting in tasty cream puff. 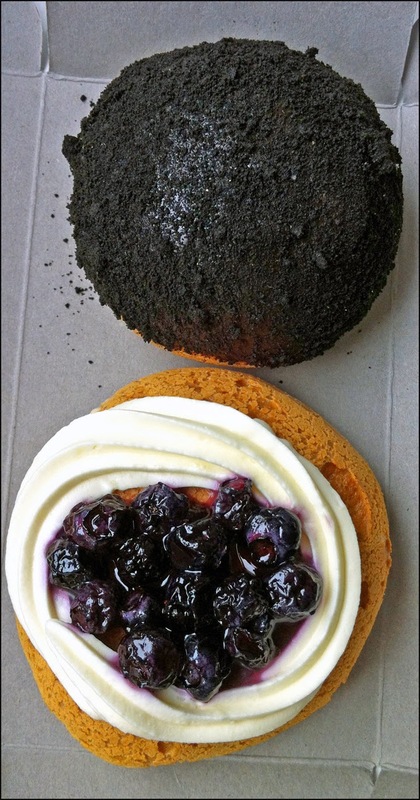 The Blueberry Cream Cheese cream puff was topped with glazed blueberries encircled with a tangy cream cheese ring. Within, instead of a chocolate whipped cream, a Chantilly cream was deployed. Personally I found the Chantilly cream too sweet for my liking. 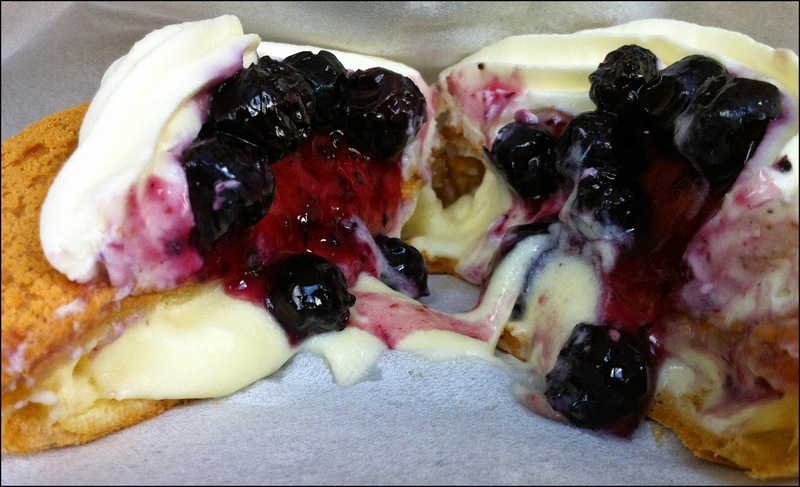 Also, I understand the cream cheese is used as barrier to prevent the blueberry topping from slipping off the pastry (you can see what happens when I attempt to cut the thing in half – there were issues). However, I found the tanginess of the cream cheese a bit odd. On my second visit, I went with 2 chocolate dipped cream puffs: the Almond Crunch and the Double Chocolate Crunch. The Almond Crunch had wafer thin slices of toasted almonds covering the top of the cream puff. Much like the Oreo, the almonds were “glued” on with a layer of chocolate and used the same cocoa whipped cream. Since I like almonds, I really enjoyed the Almond Crunch. I felt the all the components were present, lent their distinct flavours to the sweet snack and were in harmony with one another. The other cream puff I purchased, the Double Chocolate Crunch, was too boring for me. The pastry was dipped in chocolate and topped with white and milk chocolate coated round crunchies. With the chocolate infused whipped cream, chocolate layer and chocolate crunchies, there was no contrasting flavour. I guess if you love chocolate this may be the puff for you but for me I just found it too plain. Overall, I liked the Almond Crunch and Oreo Chewy Junior due to the varying and complementary flavours found within each preparation. I can see people questioning the value of these cream puffs. However, for people like me who only have a moderate sweet tooth, Chewy Junior is perfectly satisfying.